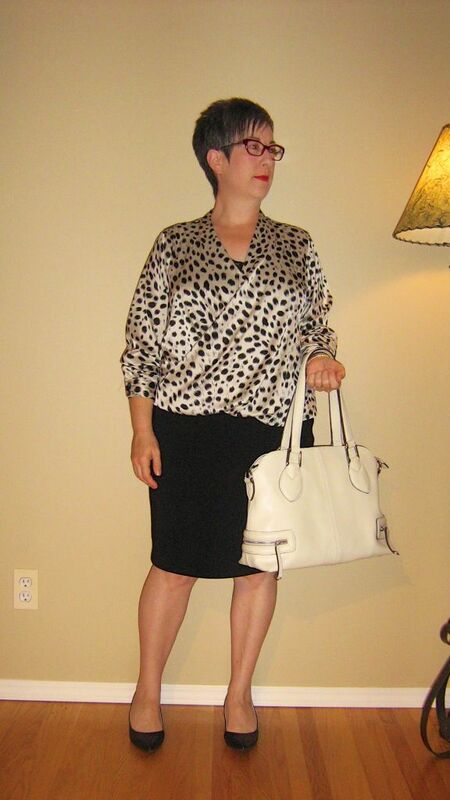 Today's outfit started with my cream and black animal print front wrap blouse. I wish the blouse didn't photograph quite so shiny - it's a little more matte IRL but the flash gives it more of a sheen. 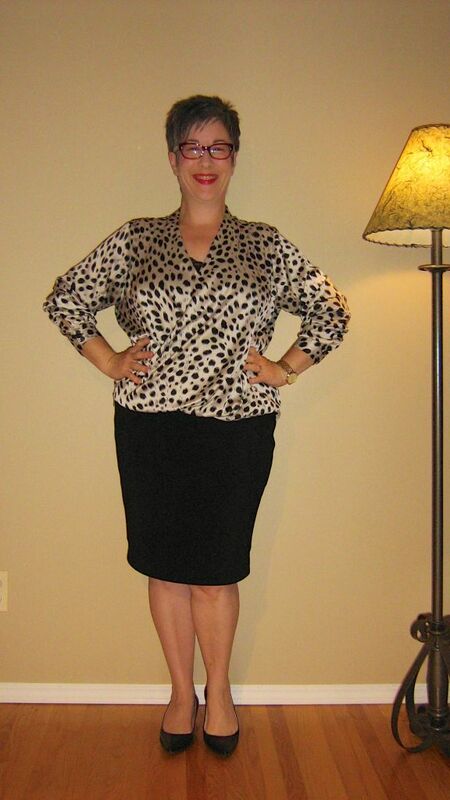 I've paired the blouse with a simple black knit pencil skirt and my pointy toe kitten heels. 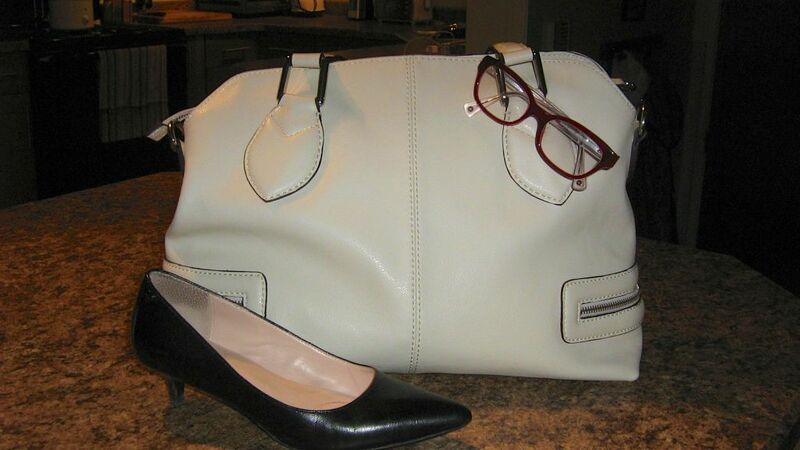 Accessories include my gold watch and wedding band, large cream handbag, red specs and red lip. Pretty simple outfit. 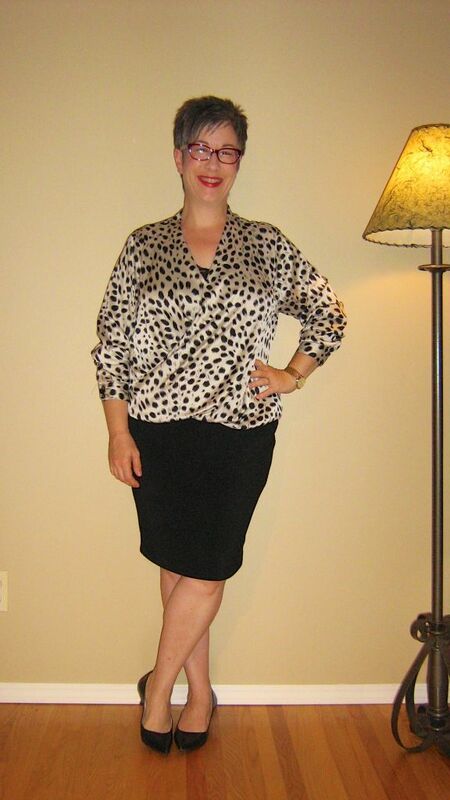 I really like a front wrap blouse with deep v-neck for my body shape. The wrap hides the wobbly bits and the v-neck helps to elongate my short torso. Plus I find it an easy style to wear on its own or layered with a vest, blazer or moto jacket. Note to self: look for more front wrap blouses for this fall season. I have noticed that there's a lack of blouses in my wardrobe. So what do you think of this outfit? As always, all comments/suggestions welcome. I like the simplicity of the outfit for you. I see it as elegant and pretty. I am a sucker for B&W prints. It seems like this style of top works for many body shapes. I was thinking about getting another one too. Janet has a really nice B&W one in her WIW. Love! Wrap blouses are sure forgiving :). Yes, I have to agree, a wrap top is very flattering. There seem to be lots in the shops right now too. Very nice! I love them for the same reasons. YLF! Count me in as another wrap blouse fan. They were a revelation to me last year, so helpful especially on those days I feel less than svelte :-) Plus they usually are loose enough to layer a cami for extra warmth and coverage if the v is too low. I'm a new fan of the wrap blouse too! This is a lovely one on you. The whole outfit has a great modern classic vibe, and you always look so fab in b&w. Gorgeous! I love the wrap blouse and would like to find one for myself. Also on the hunt for the right faux wrap blouse. Must be pinned though, or have a stitched closure - will not fuss with adjusting it all day. If you find more - let us know ! I love this one on you - you are dead right about it's flattery points. I love this, Shannon! Modern-classic and very chic. I am a convert to the non-knit wrap blouse club as well. The knit wraps seem to hug the bust and not stay covered as well. Love this sort of outfit - just chic and easy! great blouse. i like how it dress up a simple outfit, i could see how this could become an FFB item for you. Dorothy Perkins petite you say? Well that is tempting. It is a beautiful blouse and you look wonderful! Excellent outfit - looks like it should be on the FFBO list! Lovely blouse. You look very elegant in this outfit. Love that top. I don't mind the shine at all. The drape and the slim skirt make this a perfect silhouette for you. You must wear this again. The black & white tones of the blouse pattern are so "you". Just great with your coloring and will work with black (and probably gray) and your solid brights. Gorgeous outfit, Shannon! 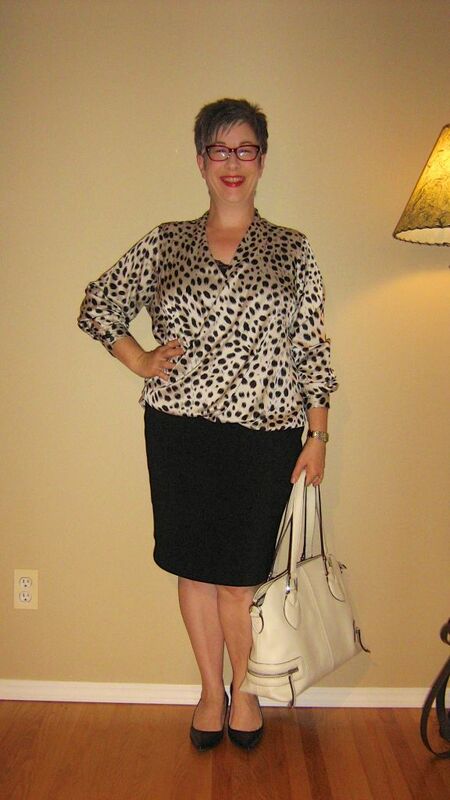 I love the black and white animal print on you, and the skirt is a perfect length and shape. Great with your black pumps! That's an absolutely lovely outfit on you, Shannon! That blouse drapes beautifully on you and I love the sheen on it! I find it difficult to wear blouses like that but then again, I'm a slightly different body type. But wow! So elegant and gorgeous! You had me at the wrap top. So brilliant!